Yitzchak Rabin (sometimes spelled Yitzhak Rabin) (יצחק רבין in Hebrew) (March 1, 1922 – November 4, 1995) was an Israeli politician and general. He was the fifth Prime Minister of Israel from 1974 until 1977 and again from 1992 until his assassination in 1995. He was the first Prime Minister of Israel born in the Land of Israel, the only Prime Minister to be assassinated, and the second to die in office. Yitzchak Rabin was born in Jerusalem while it was occupied by the British (during the British Mandate of Palestine). His father, Nehemiah, had immigrated to Israel from the United States, and served as a volunteer in the Jewish Legion during World War I. His mother, Rosa Cohen, immigrated to Israel from Russia in 1919, and was one of the first members of the Haganah, the mainstream Jewish defense organization. When he was one year old, his family moved to Tel Aviv. In 1940 he graduated with distinction from the Kaduri Agricultural High School. His matriculation was his last formal education, with the exception of some military strategy courses which he took in the United Kingdom. He aspired to become an irrigation engineer. In 1948, the year of Israel's independence, Rabin married his wife, Leah. On June 2, 1974, Yitzchak Rabin was elected leader of the Labor Party and succeeded Golda Meir as Prime Minister of Israel. During Yitzchak Rabin’s term in office was the famour Operation Jonathan, in which the IDF rescued passengers of a plane hijacked by Palestinian terrorists. Rabin resigned from office after two crises hit him: a scandal emanating from the delivery of four F-15 fighter jets to Israel on the Jewish Sabbath (Shabbat) led to the breaking up of his coalition; and the exposure of an illegal bank account held by his wife, Lea Rabin. Following his resignation, the first Likud prime minister ever, Menachem Begin, was elected to office in 1977. During the late 1980's Rabin was a Minister of Defence in several unity governments and enacted harsh measures to break the first Intifada. He was quoted as saying 'We should break their arms and legs' (referring to Palestinian rioters). 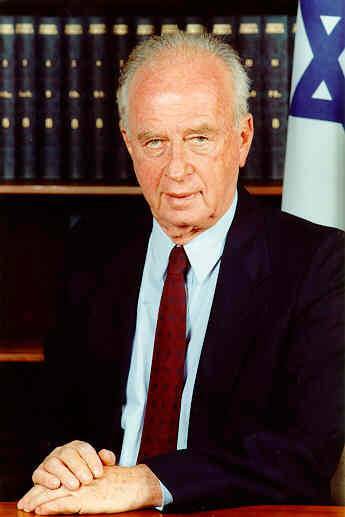 In 1992 Yitzchak Rabin was once again successfully elected Prime Minister. He played a leading role in the signing of the Oslo Accords, which created the Palestinian Authority and granted it partial control over parts of the Gaza Strip and West Bank. Prior to the signing of the accords, Rabin received a letter from PLO Chairman Yasser Arafat renouncing violence and officially recognizing Israel, and on the same day Rabin sent Arafat a letter officially recognizing the PLO on September 9, 1993. During this term of office, Rabin also oversaw the signing of the Israel-Jordan Treaty of Peace (1994). For his role in the creation of the Oslo Accords, Rabin was awarded the 1994 Nobel Peace Prize, along with Yasser Arafat and Shimon Peres. The Accords greatly polarized his image in Israeli society, some seeing him as a hero for advancing the cause of peace and some seeing him as a traitor for giving away land they saw as rightfully belonging to Israel and endangering Israelis. Also, Rabin's government was kept in office, and his concessions to the Palestinians passed in the Knesset, only through the support of Arab-Israeli parties including the Communist party. While Yitzchak Rabin was certainly motivated by peace, terrorism by Palestinians against Israeli civilians escalated significantly after the implementation of the Oslo accords and the concessions Israel granted the Palestinians. On November 4, 1995, Rabin was assasintated by Yigal Amir, an ultantionalist, after attending a rally promoting the Oslo process at Tel Aviv's Kings of Israel Square (which has since been reanmed, Kikar Yitzchak Rabin, the Yitzhak Rabin Square). Fatally wounded by two or three gun shots, he died of massive blood loss and a punctured lung on the operating table at the nearby Ichilov Hospital in Tel Aviv. There is controversy over the circumstances of his death as officially reported. Today, Yitzhak Rabin remains a controversial figure. Some Israelis remember him as Israel's great man of peace. After his untimely death, Rabin was turned into a national symbol, especially for the Israeli left. He is also seen as a representation of the possible success of the Arab-Israeli peace process that Rabin initiated. Many in Israel today claim that the murder of Rabin stopped the peace process dead in its tracks, and that Rabin could have led Israel to a permanent peace. Others remember Rabin as a man who began a foolish process of yielding to terrorists and offering concessions that have led not to peace, but to increased terrorism and bloodshed of both Israelis and Palestinians. Yitzchak Rabin continues to be revered and honored through many venues. 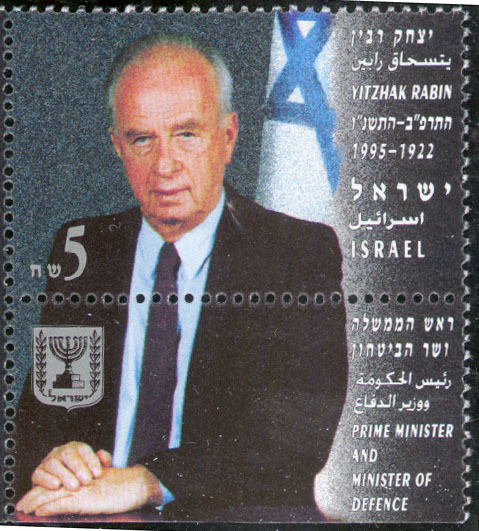 The following is an example of an Israeli stamp issued in his honor/memory.